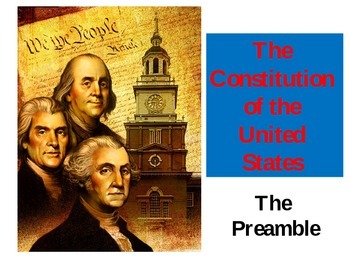 This is the first in a series of powerpoints that attempts to explain the United States Constitution to upper Elementary/Middle School students. 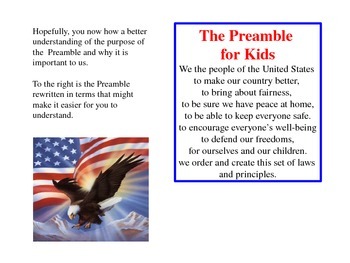 It uses easy to understand vocabulary that young students will understand and appreciate. 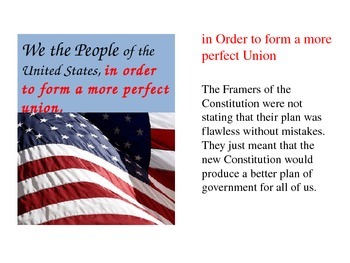 Any study of the Constitution should begin with a understanding of its purpose - The Preamble is that purpose. 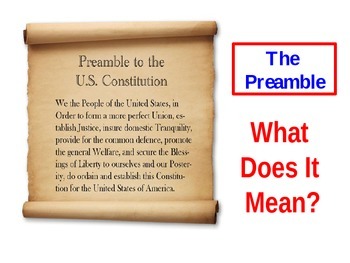 This powerpoint takes the Preamble, phrase by phrase, and explains the meaning of each. Includes colorful pictures of American symbols. It has been revised by adding assessment slides to the end of the PowerPoint that will check your students' understanding of the main ideas.